Antoni Gaudí’s Park Güell is a wonderland of strange shapes, magnificent mosaics and fantastic views of Barcelona. It was a quaint oasis before the Olympics, but after a heavy marketing campaign featuring the park’s mosaic kimodo dragon it became one of the premier tourist spots in the city…. …which means you probably have it on your list of things to do in Barcelona. And that’s a fantastic idea! Riding the bus to Park Güell is the easiest way to get to there. 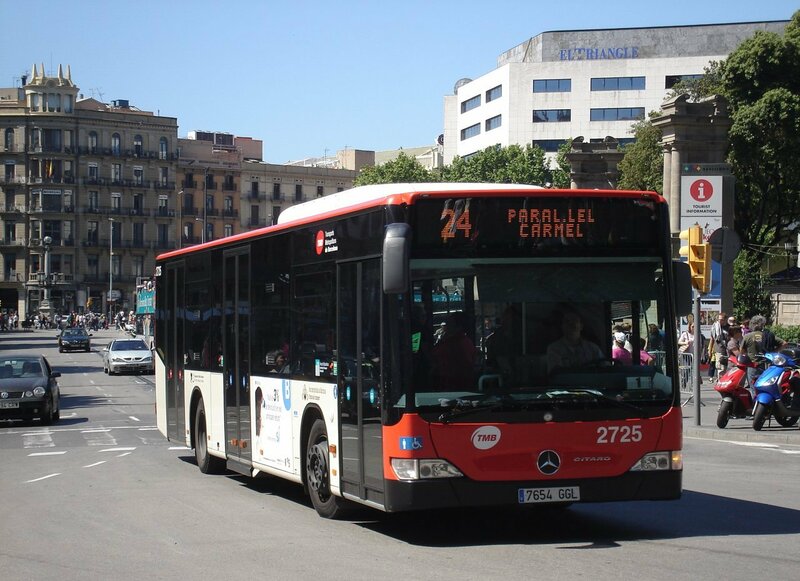 Be a bus boss and hope on the 24 bus…it starts in Plaza Catalunya, drives up Passeig de Gracia (best architecture and shopping in the city) then winds its way up a few hillsides to the park. Get off at the Ctra. de Carmel – Park Güell stop and you’ll find yourself at the more tranquil back entrance of the park. Buy your tickets (if you haven’t already) and walk in! Time of trip: From Plaza Catalunya About 40 minutes, depending on the bus schedule and traffic. Not too many metro lines make a living going uphill and that’s why you can’t use the metro to get close to Park Güell. The green line (L3) is your money shot here … you can get off at Lesseps or Vallcarca. You can choose between the two. The escalators to Park Güell near the Vallcarca station. Getting off at Vallcarca means you’ll walk a bit then have the option of taking an escalator up to the park. Lesseps is walking — half on flat ground and half uphill. Our advice — follow the crowds and you’ll get there just fine. Time of trip: From Plaza Catalunya, about 30-45 minutes depending on your fitness level. Taxis are a great choice for their availability and ease. Flag one down, hop in and say “Park Güell”. That’s it. Cab fares are standardized. Extra fees are based on how many people are in the car, how many pieces of luggage you have and whether or not you called ahead to request the taxi. Cost of trip: From the port a ride should be about 15-20 euros, from Plaza Catalunya, about 10-15 euros. Time of trip: From the port, the ride will take about 20-25 minutes, depending on traffic. For Barcelona public transit pros only — ride the yellow line (L4) to Alfons X, follow the signs to the H6 (Zona Universitaria), get on the H6 and ride it two stops to CAP Larrard, hop off and walk two blocks to Carrer Larrard. Walk up the street about half a block catch the 116 bus. It will drop you off right in front of the park. Time of trip: From the Passeig de Gracia metro station, about 20-35 minutes depending on the bus schedule. If you don’t mind a bike ride that turns your quads and calves to dust, riding a bike up to Park Güell can be a great adventure. But seriously, your legs will be burning like the fires of Rome. And seriously, if you want a good bike rental, check out our city bike rentals…or mountain bikes, if you prefer….or a road bike, if that’s your style. Cost of trip: €12-€30 for a three-hour rental with store pick-up, €22-€40 for a three-hour rental with bike delivery (that’s right, we’ll deliver them to your door). Time of trip: Biking to Park Güell from the city center can take anywhere between 30 to 45 minutes, depending on your fitness level.